Rate this project TrueOS is a FreeBSD-based operating system which features a graphical system installer and a rolling release platform. The TrueOS team has announced the availability of a new snapshot, TrueOS 18.03, which includes fixes for the Meltdown and Spectre classes of CPU bugs. "The TrueOS team is pleased to announce the availability of a new stable release of the TrueOS project (version 18.03). This is a special release due to the security issues impacting the computing world since the beginning of 2018. In particular, mitigating the 'Meltdown' and 'Spectre' system exploits make it necessary to update the entire package ecosystem for TrueOS. This release does not replace the scheduled June STABLE update, but provides the necessary and expected security updates for the stable release branch of TrueOS, even though this is part-way through our normal release cycle. Important changes between version 17.12 and 18.03: 'Meltdown' security fixes; 'Spectre' security mitigations...." More details on TrueOS 18.03 can be found in the project's release announcement. TrueOS is available in two editions: Desktop and Server. Download (pkglist): TrueOS-Desktop-18.03-x64-DVD.iso (2,490MB, SHA256, signature, torrent), TrueOS-Server-18.03-x64-DVD.iso (884MB, SHA256, signature, torrent). 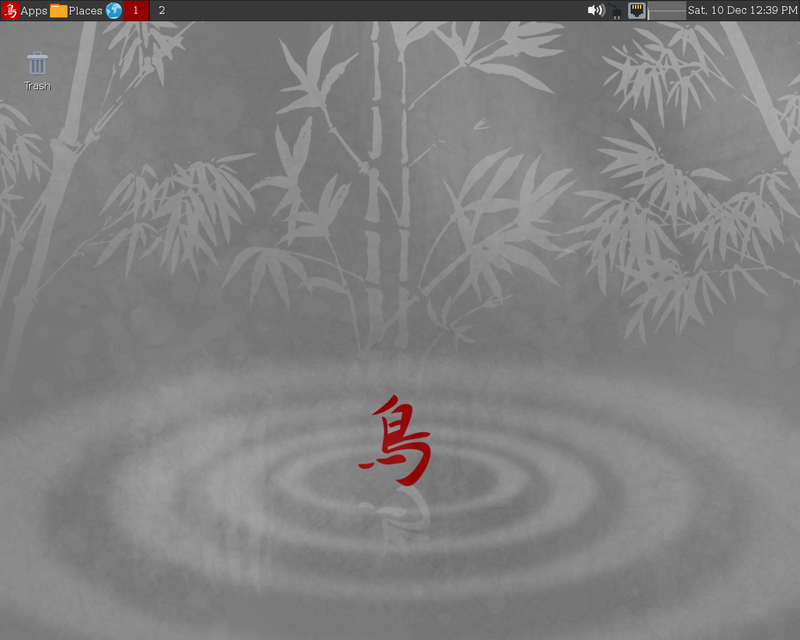 TrueOS is an open source operating system based on FreeBSD's development branch. TrueOS provides a rolling release platform featuring the Lumina desktop environment and the OpenRC service manager. The project's latest snapshot, version 17.12, includes LibreSSL in the base system (replacing OpenSSL), Bhyve virtual machine support, and the latest drivers supplied by FreeBSD's 12.0-CURRENT branch. "Notable changes: over 1,100 OpenRC services have been created for 3rd-party packages, this should unsure the functionality of nearly all available 3rd-party packages that install/use their own services; the OpenRC services for FreeBSD itself have been overhauled, resulting in significantly shorter boot times; separate install images for desktops and servers (server image uses a text installer); Bhyve support for TrueOS Server install; FreeBSD base is synced with 12.0-CURRENT as of December 4th; FreeBSD ports tree is synced as of November 30th; Lumina desktop has been updated to 1.4.1." Additional changes and a list of key package versions can be found in the project's release announcement. Download (pkglist): TrueOS-Desktop-17.12-x64-DVD.iso (2,763MB, SHA256, signature, torrent, TrueOS-Server-17.12-x64-DVD.iso (911MB, SHA256, signature, torrent). The TrueOS project creates a rolling release operating system that is based on FreeBSD's -CURRENT development branch. The TrueOS team has released a new snapshot, version 2017-06-01, of their operating system which now features two branches: STABLE for users who want a more consistent experience, and UNSTABLE for people who want to test the latest developments. The installation media now tries to stick with low level drivers (like vesa) to provide the widest range of compatibility, the OpenRC init software has been updated to version 0.26.2 and the Lumina desktop has been updated to version 1.2.2. "A new STABLE update for TrueOS is available! Released on a six month schedule, STABLE updates represent a significant step forward for TrueOS (see our earlier post discussing this change). There is more extensive testing of new features and less experimental work in STABLE images, resulting in a more solid and usable experience. Current TrueOS users can update using the built-in update manager." A list of recent changes to TrueOS can be found in the project's release announcement. TrueOS can be downloaded in two separate builds, one for DVDs and another for USB thumb drives. Download: TrueOS-2017-06-01-x64-DVD.iso (2,552MB, SHA256, signature, torrent), TrueOS-2017-06-01-x64-USB.img (2,748MB, SHA256, signature, torrent). 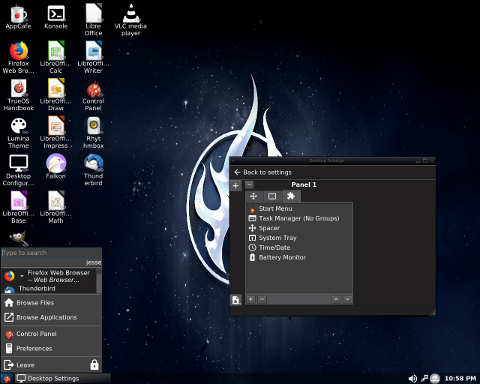 TrueOS is a rolling release operating system based on FreeBSD. The TrueOS team has released a new snapshot of the operating system's Desktop and Server editions. The new snapshot includes several bug fixes, a few new services and package updates. TrueOS 2017-02-22 also includes support for automounting devices and a new jail management utility: "Automounting - This new feature allows auto-detection and mounting of inserted USB devices. It also automatically unmounts USB devices when the user ceases accessing the device. See the blog post on automounting for more details about this useful new feature. New jail utilities jbootstrap (requires being run once to fetch base packages), jinit, and jdestroy are available. These support OpenRC development and add other functionality. See the blog post on these new jail utilities for more details." The release announcement has further information. Download (pkglist): TrueOS-Desktop-2017-02-22-x64-DVD.iso (2,320MB, SHA256, signature, torrent), TrueOS-Server-2017-02-22-x64-DVD.iso (1,530MB, SHA256, signature, torrent). Kris Moore has announced the launch of a new stable PC-BSD release. The project's latest version, PC-BSD 10.3, is intended to be the final release in the project's 10.x branch and is based on FreeBSD 10.3. PC-BSD 10.3 uses the FreeBSD boot loader with GRUB offered as an optional alternative. UEFI support has been improved in the system installer and the operating system ships with Lumina 0.8.8 as one of the available desktop environments. "The PC-BSD team is pleased to announce the availability of 10.3-RELEASE! This is currently planned to be the last maintenance release in the 10.X series, and we are currently working hard on the upcoming 11.0. A very special thanks to all the developers, QA, translation and documentation teams for helping to make this release possible." PC-BSD is available in two editions, the desktop edition and the TrueOS edition for servers. Additional changes and upgrade instructions for existing users can be found in the project's release announcement. Download (pkglist): PCBSD10.3-RELEASE-03-31-2016-x64-DVD.iso (3,860MB, SHA256), TRUEOS10.3-RELEASE-03-31-2016-x64-DVD.iso (824MB, SHA256). Dru Lavigne has announced the launch of PC-BSD 10.2. The PC-BSD project is based on FreeBSD and offers users pre-configured desktop environments, ZFS on root and graphical system administration utilities. The new release includes several bug fixes and a number of new features, including a CD-sized network installation disc. "The PC-BSD team is pleased to announce the availability of 10.2-RELEASE! A very special thanks to all the developers, QA, and documentation teams for helping to make this release possible. PC-BSD 10.2 Notable Changes: FreeBSD 10.2-RELEASE base system; Many bug fixes and enhancements to installer to dual-boot setups; New CD-sized network installation media, with wifi Configuration via GUI; Switched to `iocage' for jail management backend; Disk Manager GUI now available via installer GUI; Bug-fixes and improvements to Life-Preserver replications; Improved localization options for login manager..." This release also features a server edition of PC-BSD called TrueOS. Further information is available in the project's release announcement. Download (pkglist): PCBSD10.2-RELEASE-08-19-2015-x64-DVD-USB.iso (4,178MB, SHA256, torrent), TRUEOS10.2-RELEASE-08-19-2015-x64-DVD-USB.iso (763MB, SHA256, torrent). Ken Moore has announced the availability the first release candidate for PC-BSD 10.2, a desktop-oriented operating system with FreeBSD as its base: "The PC-BSD team is pleased to announce the availability of RC1 images for the upcoming 10.2 release. Please test these images out and report any issues found on our bug tracker. PC-BSD 10.2 notable changes: FreeBSD 10.2 base system; many bug fixes and enhancements to installer to dual-boot setups; new CD-sized network installation media, with Wifi configuration via GUI; switched to 'iocage' for jail management backend; disk manager GUI now available via installer GUI; bug fixes and improvements to Life-Preserver replications; improved localization options for login manager; options to enable / disable SSHD or IPv6 at installation; new 'Plugins' system for AppCafe, allowing download of pre-built jail environments; improvements to look-and-feel of AppCafe for package management; improved fonts and better support for 4K monitor setups; enterprise package repository, which only has security updates...." Read the full release announcement for further details. Download: PCBSD10.2-RC1-04-30-2015-x64-DVD-USB.iso (4,191MB, SHA256, torrent, pkglist). Ken Moore has announced the release of PC-BSD 10.1.2. The PC-BSD project offers users a desktop-oriented operating system based on FreeBSD. The project also provides a server edition, called TrueOS. The latest release of PC-BSD allows users to maintain their home directories on an encrypted external drive and offers encrypted guest accounts. This release also includes Tor mode, an option that forces all network traffic through the Tor network. "The PC-BSD team is pleased to announce the availability of the next PC-BSD / TrueOS quarterly release, 10.1.2. PC-BSD 10.1.2 notable changes: New PersonaCrypt utility allows moving all of users $HOME directory to an encrypted USB Drive. This drive can be connected at login, and used across different systems. Stealth Mode - allows login to a blank $HOME directory, which is encrypted with a one-time GELI key. This $HOME directory is then discarded at logout, or rendered unreadable after a reboot. Tor mode - Switch firewall to running transparent proxy, blocking all traffic except what is routed through Tor. Migrated to IPFW firewall for enabling VIMAGE in 10.2. Added sound configuration via the first boot utility." Further details and instructions for upgrading from previous releases can be found in the project's release announcement. Downloads: PCBSD10.1.2-05-15-2015-x64-DVD-USB.iso (4,084MB, SHA256, torrent, pkglist), TRUEOS10.1.2-05-15-2015-x64-DVD-USB.iso (611MB, SHA256, torrent). Dru Lavigne has announced the availability of a new PC-BSD release candidate. PC-BSD 10.1.2-RC1 can now be downloaded and installed for testing purposes. The release candidate offers users a number of interesting security features, such as the ability to store all personal files on an external (and encrypted) USB drive and Stealth Mode, which provides users with an encrypted, one-time-use guest account. "The PC-BSD team is pleased to announce the availability of RC1 images for the upcoming quarterly 10.1.2 release. Please test these images out and report any issues found on our bug tracker. PC-BSD 10.1.2 Notable Changes: New PersonaCrypt Utility allows moving all of users $HOME directory to an encrypted USB Drive. This drive can be connected at login, and used across different systems; Stealth Mode allows login to a blank $HOME directory, which is encrypted with a one-time GELI key. This $HOME directory is then discarded at logout, or rendered unreadable after a reboot; Tor mode switches the firewall to running transparent proxy, blocking all traffic except what is routed through Tor; Migrated to IPFW firewall for enabling VIMAGE in 10.2..." More information is provided in the project's release announcement. Download: PCBSD10.1.2-RC1-04-30-2015-x64-DVD-USB.iso (4,048MB, SHA256, torrent, pkglist).